In universities, lecture halls and seminar rooms demand good speech. Usually, the lecture halls are fitted with sloped seating area, so that a proper direct sound coverage from the talker or the public address system is supplied. Nevertheless, acoustic measures for the control of reverberation field should be carried out in all lecture halls and also in the mostly flat seminar rooms. In addition to good speech intelligibility, visual aids such as video projectors and notebook connections are used, also with WLAN. The networking in lecture halls plays an increasingly important role. New school design by D. Liebeskind, construction time 2007 - 2017. The central building with the AudiMax is very sophisticated from the architectural and acoustic points of view. High demands in the planning of the voice amplification system in reverberant rooms. Renovation of the audiovisual systems of the large divisible auditorium, the three smaller lecture halls, as well as the four seminar rooms. Modernization of the entire signal distribution and digital networking. New construction of the university building. 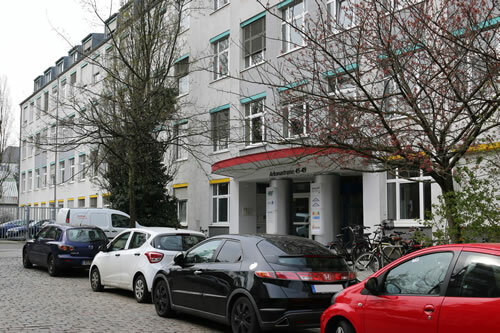 In cooperation with GCA Ingenieure AG, the permanently installed titles of audio and video systems were planned and the execution supervision was carried out. 2016/2018 Renovation of the Ewart Memorial Hall, which was built in 1928. In addition to performing measurements in the hall, the renovation of the wall and ceiling finishing naterials was planned, and a proposed mew loudspeaker solution was reviewed. New construction of the Schiller Library in 2012 - 2015. ADA planned the room acoustics in public areas such as borrowing, work and free-time areas and in 2 function rooms.